Caught in the crossfire of a criminal conspriacy, lawyer Jennifer Walters got a blood transfusion from her cousin Bruce Banner, and found herself transformed into the uninhibited personification of her repressed longing for a life of adventure. The most powerful woman ever to walk the face of the Earth, She-Hulk retains her normal intelligence and personality. 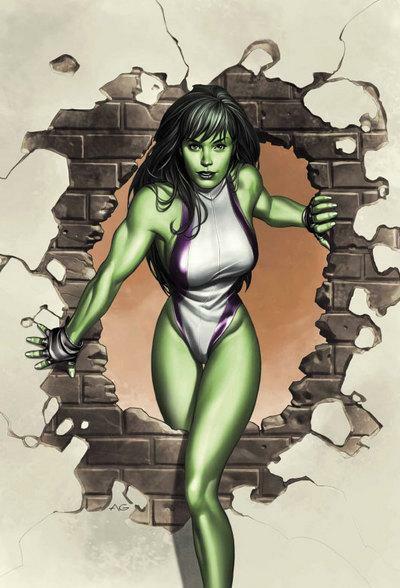 She-Hulk possesses superhuman strength and can press at least 75 tons. By and large, She-Hulk is impervious to injury, pain and disease: Her skin is able to withstand extremes of temperature, as well as tremendous stresses and impacts without puncture wounds or lacerations. She-Hulk's highly efficient physiology renders her immune to all terrestrial diseases. Last updated by DAMartin on January 14, 2016. Contribute Profile Information for She-Hulk. There are two more She-Hulk figures in the Incredible Hulk line by Toy Biz (96-97) that are not listed here.